Erebia meolans on the left often has red bands with the eyespots off-centre to the outside. 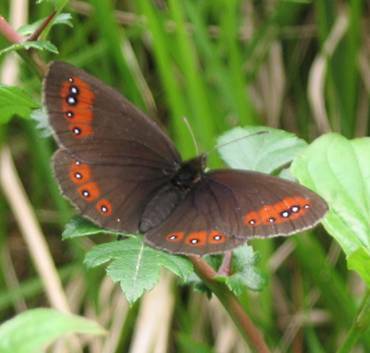 The hindwing red patches are quite extensive and squareish. 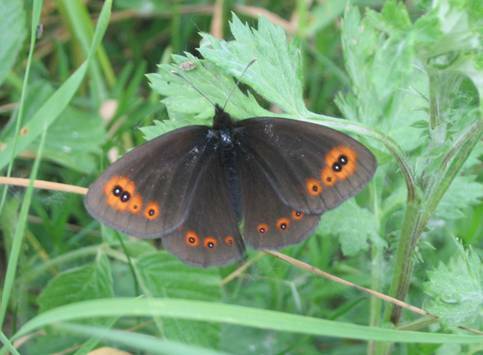 Medusa on the right has comparitively orange bands with the eyespots nicely centred within. On the hindwing the orange patches are small, nicely rounded and well separated. 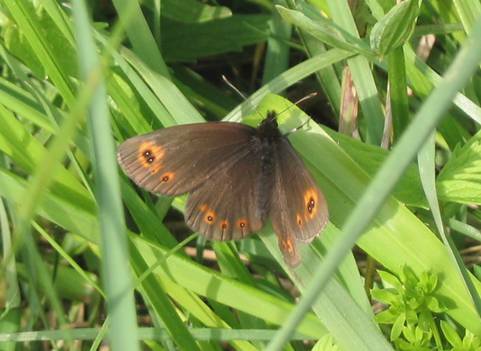 These orange-ringed hindwing markings are identical on the under hindwing (visible in the photo above) whereas in meolans the red patches are absent or very discrete on this surface. 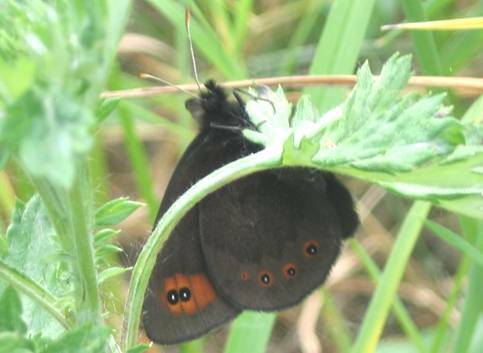 The topmost little eyespot on the forewing of meolans, whose relative position is often used as diagnostic in separating from Erebia triaria, is often absent especially in males. 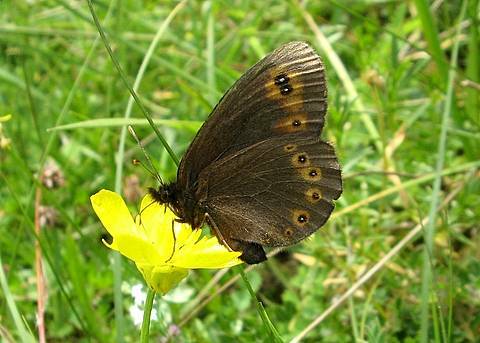 The Woodland Ringlet flies fairly early and at low altitudes for this genus. I found a colony quite unexpectedly at 600m in the Massif des Bauges on very calcareous terrain at a lakeside. Whilst photographing them I believed wholeheartedly that I had Erebia meolans and it was only when I got home that I realised from the pictures, in particular the pale individual, that they were in fact all medusa. What a nice surprise to find I had a species I'd never seen before!! This goes to prove the value of photos and that closely related species can be awfully baffling at times in the field! Meolans is about the same size, flies at the same time and at similar altitudes and there is some distributional overlap. See the comparison of uppersides on this page which shows really how different they look. 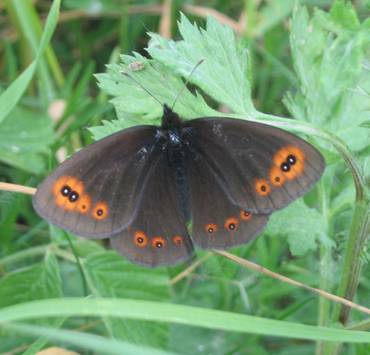 The three uppersides photos of medusa serve well to illustrate the variation in size and number of ocelli, the extensiveness of the orange areas and the intensity of the brown ground colour within a single Erebia species. 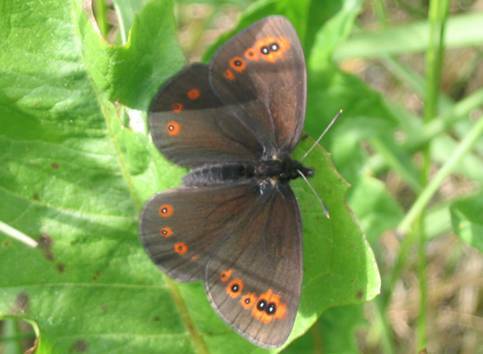 Many Erebia show this variation and I am concluding that the more fully marked individuals are generally females. I've encountered medusa as low as 320m in the Côte d'Or (21) département and also in the Jura (39).